Thousands of companion animals are born every year in our region without a loving home to take them in. They are euthanized or live and die on the streets, a direct result of pet overpopulation. Spaying/neutering our companion animals will help control and reduce this epidemic and provide many other benefits to the animals and community. Besides preventing unwanted litters, neutering your male dog or cat—the surgical removal of the testicles—prevents testicular cancer. Neutered cats and dogs focus their attention on their human families. On the other hand, un-neutered dogs and cats may mark their territory by spraying strong-smelling urine all over the house. Indoors, male dogs may embarrass you by mounting on furniture and human legs when stimulated. Aggression problems can be avoided by early neutering, though neutered dogs protect their homes and families just as well as un-neutered dogs. While cycles can vary greatly, female felines usually go into heat for four to five days every three weeks during breeding season. In an effort to advertise for mates, they will yowl and urinate more frequently—sometimes all over the house. Un-spayed female dogs generally have a bloody discharge for about a week, and can conceive for another week or so. An intact male in search of a mate will do just about anything to get one! That includes digging his way under the fence and making like Houdini to escape from the house. And once he is free to roam, he risks injury from traffic and fights with other males. 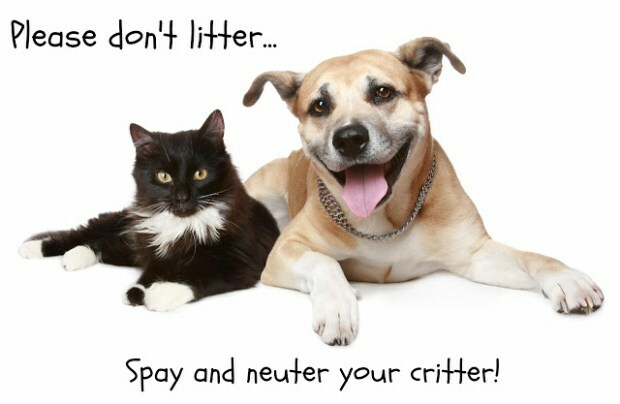 The cost of your pet’s spay/neuter surgery is a lot less than the cost of caring for a litter. It also beats the cost of treatment when your un-neutered tom escapes and gets into fights with neighborhood strays… or the cost of cleaning the carpet that your un-spayed female keeps mistaking for her litter box… or the cost of… well, you get the idea! The cost for animal control and housing/caring for an animal in a shelter is 4 to 5 times more on average than a low cost spay/neuter, saving tax payers money. Stray animals often pose problems between neighbors, create neighborhood nuisances, and cause vehicular accidents. We have heard many people say that they don’t want their pet to be spayed/neutered because their children will miss the miracle of birth. But you know what? Letting your pet produce offspring you have no intention of keeping teaches your children irresponsibility. Anyone who has seen an animal euthanized in a shelter for lack of a home knows the truth behind this dangerous myth. There are countless books and videos available to teach your children about birth in a responsible manner, without sacrificing animals to do so. 9.) It Will NOT Make Your Pet Fat! Lack of exercise and overfeeding will cause your pet to pack on the extra pounds, not neutering. Your pet will remain fit and trim as long as you continue to provide exercise and monitor food intake. And last, but certainly not least, thousands of cats and dogs of all ages and breeds in Southern West Virginia are euthanized annually or suffer as strays. These high numbers are the result of unwanted, unplanned litters that could have been prevented by spaying or neutering. We at the Fix’Em Clinic are dedicated to providing a non-lethal solution to the problem of pet overpopulation.